It's all about smoke today. 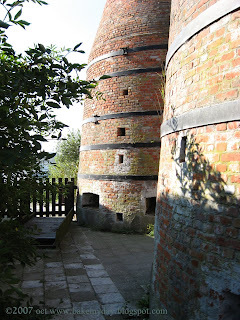 These are the lime kilns at the museum, the food starts down here! This lovely piece of fish Floris is cradling in his lap is something some of you might be familiar with, I think in English it's called "kipper", which we call "bokking" in Dutch (böckling in Swedish and German), although my Mom told me that when she was a little girl and visiting family in Zwolle, one of the highlights of her visit was the visit to the market where she was treated to a "kippetje" which sounds familiar enough to recognize the word. (Funny enough, "kip" in Dutch is "chicken"...). So yes, it's herring and for those of you who have been visiting Holland and have been treated by well-meaning Dutch hosts to our delicacy the raw herring it must be a relieve to find we smoke the things as well. (Truth be told, there is not much food that makes me want to run away fast, but raw herring is one of them. Yuck!). No surprise that upon entering the fish smokery I thought better of ordering one of these, I had my eye on something else entirely! Floris however was coaxed into trying, although I warned him that these suckers sport lots and lots of icky tiny bones and they need an almost surgical eye and steady hand to remove and even then he had to eat them bite/choke/spit/bite fashion. I really can make things sound appetizing don't I? He had one anyway (good for him!). He was all attention and managed to pick through the bones and enjoy the succulent meat, even handed me some pieces to sample... To my surprise, I really liked it. Never too old to learn! Usually, if you have real good ones, the skin will come off fairly easily. Then, and this needs some dexterity, you'll proceed by pinching and feeling your way to the central bone (eels have only one so that makes it rather easy) and the "feeling" bit comes in because you need to decide which way the spikes go so you can pinch and slide the right way down (imagine stroking a cat against the hairs...). The flesh is firm, very rich and smokey in flavour. We used to eat them like this, old newspapers on the dining table and have an eel fest (mind image: the face of my dear husband seeing these eels.... he really thought eels were born as fillets). Best to serve this lukewarm, I like to leave them on the radiator for a while (wrapped in paper). We eat them as they are, but usually it's served on bits of toast, or as an appetizer on rye bread. Pulsed into a paté mixed with herbs and horse radish is also very good, but somehow we never get to that stage. 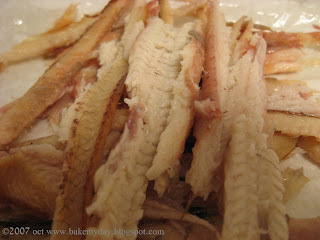 Resulting bits and pieces of eel meat, I made a mess but the flavour was soooo good! A word of advice; try to get the skinnier ones, although it might look like a good deal to pick thick eels, these tend to be dry and sometimes taste bland (or muddy). Best size is finger thick. In earlier days my grandma used to make stewed eel from the -untreated and fresh- thicker ones ("Paling in 't groen"). I still remember riding the bike with my grandfather to the fish stall, my feet firmly planted in his bike bags, buying fresh eel. Biking back home with a wriggling bunch of eel rolled in newspaper. Then, I got to sit on the kitchen counter, armed with a large wooden spoon while the eel swam in fresh water (to make sure they were clean inside and out). My job was to push them back in the sink.... Suffice to say I never ate the dish, the memory plus the smell of fish stewed in milk and herbs....no thank you. My oma and mum however thought it was a real treat! Sure! Edit: my mom read this and told me that the white liquid I remembered seeing in the pan (I think I was only 5 or 6) wasn't milk, it was butter.... 'kay....still not something I'd like to try. Thanks Mom, for helping me out here! It all sounds so wonderfully tasty! We just bought some smoked trout done locally when we were camping and heard that for this small producer, the regulations and paperwork are too much and therefore they are giving up smoking their own! 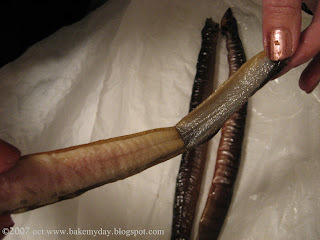 I never would have thought of smoked eel, but it actually loks good! This is amazing, fabulous post. When we come again I want an ele feast like that. I'll bring money bags! Those little babies are pricey. Floris is a brave one. I'm with Tanna! An eel feast for sure! Great stories and pictures on these past posts. I have really enjoyed them!. The newspapers on the table sound like when Mark and I would visit his folks in DC and we would go to the wharf and buy live blue crabs and take them home, steam them and eat them off pie tins with corn on the cob, a nice green salad and lots of beer and wine! Every once in a while one would escape the boiler and land on the kitchen floor crawling around. Lots of fun! Wat leuk dat je zoon zo lekker mee proeft van alles... komt dat als ze ouder worden of had hij dat altijd al?! Gezellig! These are wonderful posts, Karen. 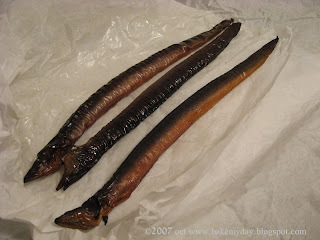 I am a big aficianda of smoked fish, though I have never had eel. My English mother told tales of going with my grandmother (a/k/a "Big Nanny"-sounds like a gangster, no?) to buy wriggling live ones from a barrel at the market. Mum couldn't bear even the idea of them, and was always cringing away and shuddering among the heartier types , but the older generation (Eastenders, all) thought them a total treat. I'm definitely ready to try the non-wriggly smoked kind. Mmm, delicious. 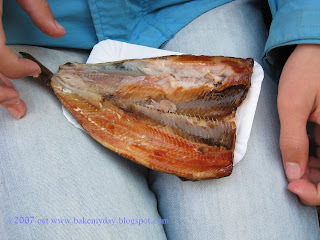 I love kippers too but haven't tried smoked eel. Your story of keeping the eels in the sink as a child - I would have loved. I'd have still eaten it though. My favourite game as a toddler apparently was playing with fish heads while my father gutted and cleaned them on return from a days fishing. 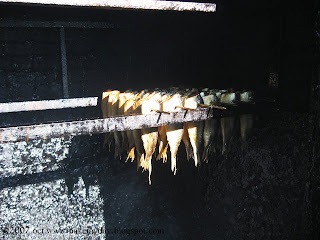 It must be my Swedish blood because I love smoked fish - of any kind. Even those eels look yummy. In fact I had smoked trout salad for lunch! I will seek out these treats when I get to Holland one of these days.